Opened as the Allen’s Downtown Theatre on November 10, 1917, it became the Tivoli Theatre in 1923. 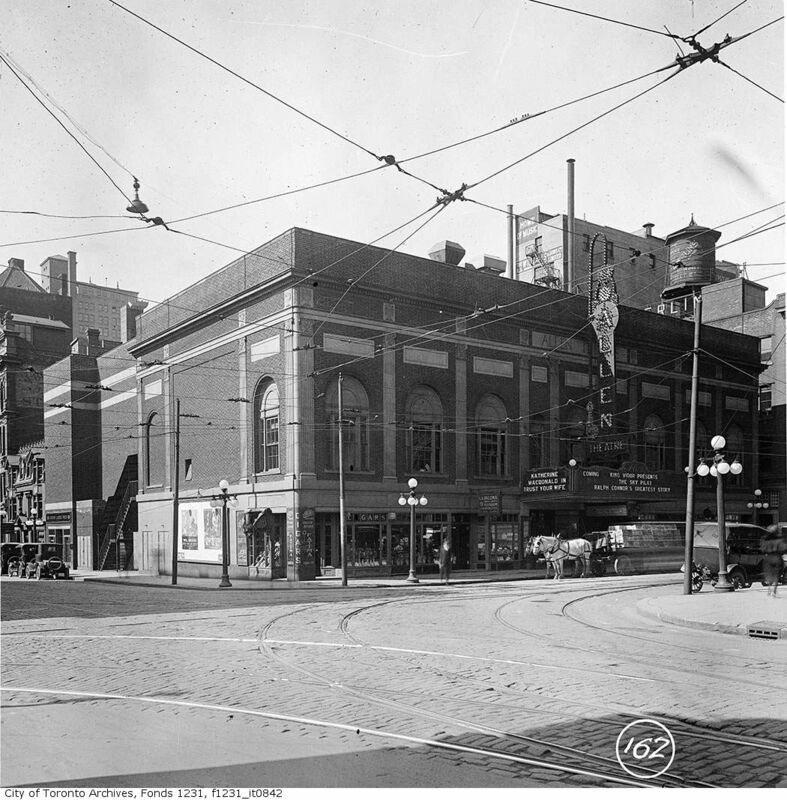 This was the first theatre in Toronto to show a talking picture (1928). It was operated by Famous Players and was closed in 1964 to be demolished in 1965. The Tivoli was a great place to see a 70mm film. Oddly enough, because of the stadium seating, there was no place to put a booth for head-on projection. Unless you were sitting toward the back, near the booth, horizontal lines were noticeably distorted. In the business this was quite often referred to as a smile. The 70mm (pseudo Cinerama) presentations at Toronto’s Glendale Cinerama theatre had exactly the same problem. You may be interested to know that both theatres had a huge screen with a 120 degree curvature and projected 70mm film with 6-track stereo sound. The Tivoli’s Todd-AO and the Glendale’s Cinerama presentations looked exactly the same to the audience. The only thing that set them apart was the huge Cinerama logo on the Glendale’s marquee. December 28 was the 80th anniversary of the first full talking picture to play in Toronto. The Tivoli was packed that night, and today’s Saturday Star has a quick writeup commemorating the event! For those interested, 32 Elvis Movies is a site dedicated to the history of Canadian movie theatres. Have a look! And yes, I’m aware the Tivoli actually closed in 1964, not 1965 as written (blame the copy editors, not me:P). The cinema played its final film in November of 1964, and the building was sold in May of the following year, to be demolished soon after. I am guessing this picture is from right after they closed as there are no features shown on the sign and the cars look to be from the early 1960s. This appears to be the same picture as the one posted on May 22, 2009. Here’s a picture from 1956 with the Tivoli marquee advertising “Rebel Without a Cause” at Shea’s (Hippodrome) Theatre. Perhaps the theater was closed when the photo was taken for conversion to Todd A-O? A portion of the Victoria Theatre can be seen at the left, probably closed as it soon would be be demolished. November 3rd, 1923 grand opening ad as Tivoli in photo section. Upload Pic showing “El Cid” in photo section. Is this the “Allen Theatre” in Toronto, Ontario, Canada, in which a Hillgreen-Lane theatre pipe organ, opus 479, was installed in 1917? I am trying to track down this instrument and its history, or at least find a few photos of it and/or a stoplist. Opus 479 was/is a two-manual, 21-rank instrument which was shipped from the Hillgreen-Lane factory in 1917 at a cost of $3,225. It featured a 3-horsepower blower, serial #8256. Could this organ, or parts of it, be playing in a church, residence, or meeting hall somewhere today? Or has the entire organ long since been destroyed? Does anyone know? The above information comes courtesy of Mr. David Junchen’s “Encyclopedia of the American Theatre Pipe Organ”, pages 166 and 167. I believe this organ is probably the sister organ to opus 478, a 2-manual, 20-rank instrument, some of which (apparently) went down with the destruction of its original home, the Liberty Theatre in Youngstown, Ohio, in 2013. I was apparently too late to save opus 478 but it may not be too late for me to save opus 479, if it still exists. This looks like one of the great roadshow houses with a truly wide screen that enveloped the audience head on. I wish more of the photos under the individual theaters had such great photos of the interior and the size of the screen in relation to the audience. Funny that this even opened as a roadshow house when so many theaters had to be converted to being one. At least in New York. Yeah SOM would have looked great here. I have a friend who has seen this Scaramouche at MOMA and while not especially a silent movie buff(he’s a big Sabatini buff) he claims it is much better than the ‘52 remake.